This three part, step-by-step course will identify your instinctive, personal strengths as well as reveal your designer SuperPowers (Part One & Two). After identifying your strengths and evaluating your goals, Part Three guides you as how best to communicate the type of work you are passionate about. 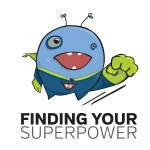 Finding Your SuperPower & Telling Your Story teaches you how to get your self-promotion pieces in the line of sight of the right people and how to find your “right people.” All while instructing you how to communicate your unique personal and design advantages to clients. This course guides you in finding personally rewarding work that utilizes your talents and feeds your soul.